A few years ago one wouldn’t have imagined, that eventually, digital medium will become a thriving place for marketers. With new trends popping up on the digital space, every day is a new opportunity for digital marketers to experiment and cater to the need of consumers. Although most digital marketing agencies in Mumbai are aware of the dos of marketing, at the same time they are ignorant about the don’ts. Here is a list of practices that should be avoided. Social media advertising can do wonders, but only if it is well strategised. 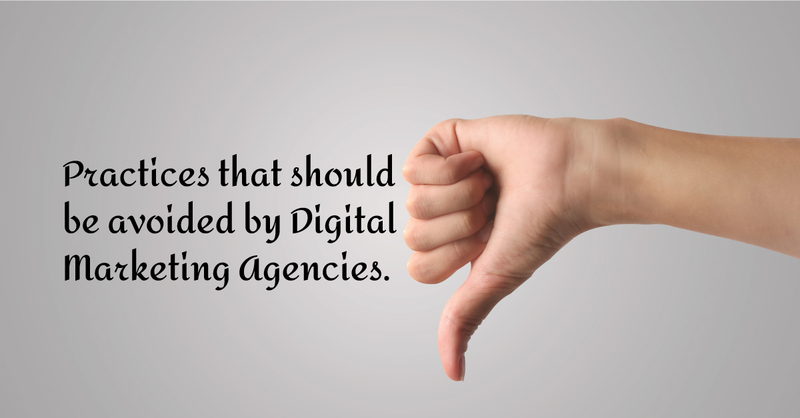 A digital marketing agency should be clear as to what message they want to convey to the consumers. Unplanned social media advertising diverts customers from the very precise place where they should actually be. Thus, it becomes difficult for the customers to understand as to what is the ad trying to convey. With new on a rise, SEO has become a very competitive space. This can generate a slower response. Even though it is true that SEO is usually the key to attract audience’s attention, it may not necessarily be accurate and reliable. For example, Google’s ever-changing algorithm can affect the traffic generated from a SEO campaign. And when that happens, there is nothing one can do to control what type or how much traffic they generate, which can leave a digital agency in a spot of uncertainty. In today’s digital age, with decreasing attention span, visuals speak louder than text. As a result, non-visual content has almost taken a backseat in terms of audience engagement. A GIF will grab a user’s attention more quickly as compared to a paragraph. E-mail marketing can do wonders, but only if they are targeted to the right audience. If not done correctly, such promotional emails usually get spammed, deleted, or worse… unsubscribed! Additionally, emails that contain certain spam words in the content are likely to be left undelivered by email-software as well as internet service providers. No matter how much you promote a big-budget multi-starrer movie, it will only work if the story appeals to the audience. Taking that example into account, a digital marketing agency should always focus on producing good content, because that is what drives any successful campaign. And to create good content, it is always better to analyse the target audience first, and then create content which can capture their attention. With easy accessibility of internet and increase in smartphones sales, the number of active online users has multiplied manifold. Since laptops cannot be carried everywhere, people often depend on their smartphones, for work or leisure. Therefore, a digital marketing agency should never neglect optimization of its website for its users, or else it may lose its prospective customer base. In order to keep audience engaged, many inundate users with too many posts. It is always better to recognize the potential customers and accordingly strategise on the appropriate content and social media platform for traction.